I am a convert to the charms of Rancho Gordo beans. They’re creamy and flavorful, don’t require soaking, and cook to perfection in under an hour. They’re even local. What’s not to love? The price tag, I suppose. These buggers cost $6 a pound, while normal beans cost maybe $2, but usually more like $0.99. I don’t cook beans often, though, so it’s not a tough cost to justify, especially when a pound stretches over many meals. Beans have a special place in my past. When I first moved to Washington, DC after college to work for the government and non-profits, I didn’t have much money. It was years before I felt comfortable spending more than $20-$30 per week on groceries. I survived for several years eating a diet heavily dependent on beans, rice, cabbage, and sweet potatoes. Beans and tofu were my primary source of protein in those years, crafted in more permutations than I care to recall. As I’ve grown my grown-up income and therefore my food budget, my shopping habits have diversified. I’ve relegated beans to “that protein in kale soup”, “a nice extra to throw on quick quesadillas”, or “the once a year bean dip batch”. This dish helps beans level up to sophistication, with the sweet tomato accent and spicy arugula playing off each other and the creamy beans. It’s a perfect fall dinner, at least here, where you can still find straggling tomatoes in the farmer’s markets even in early November. Tender white beans simmered in olive oil with garlic and spring onion, then tossed with sweet roasted tomatoes, savory sausage, and spicy arugula. Prepare the beans (if using dried beans): Cover beans with water, about an inch above where the beans stop in the pot. Add the onion, carrot, and thyme, and bring to a boil. Turn down heat, and simmer until beans are tender, anywhere from 45 minutes to 2 hours, depending on your beans. 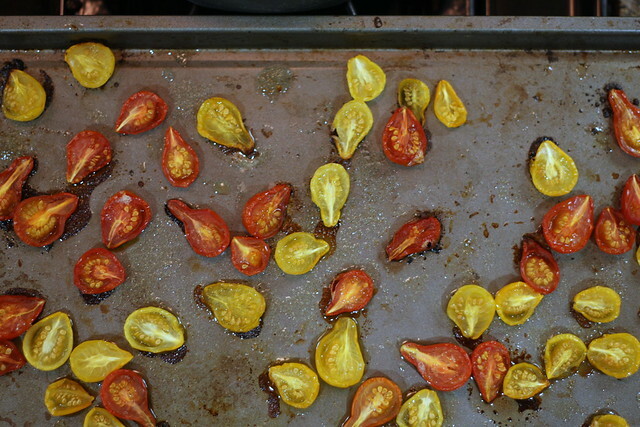 Roast the tomatoes: Preheat oven to 375. Slice tomatoes in half lengthwise and toss with 2-3 T olive oil, 1 tsp sugar, 1 tsp salt and ground black pepper. Arrange seed-side up on baking sheet, and put them in the oven for 30-40 minutes, until they are sweetly roasted. Cook the sausage: Remove the sausage from its casing and add to a heavy-bottomed saucepan over medium-high heat with 1 T olive oil. Brown the sausage, breaking it up into smaller pieces as it cooks. Once sausage is mostly browned, turn the heat down to medium low, and add the sliced spring onions or leeks and remaining olive oil. After 3-4 minutes, add the garlic, and cook until onions or leeks are translucent. Add the beans and tomatoes, and stir to coat with olive oil. Simmer for several minutes longer. Remove pot from heat. Mix in the arugula. Serve warm with crusty bread. If using normal dried beans, I like to soak them overnight before cooking. 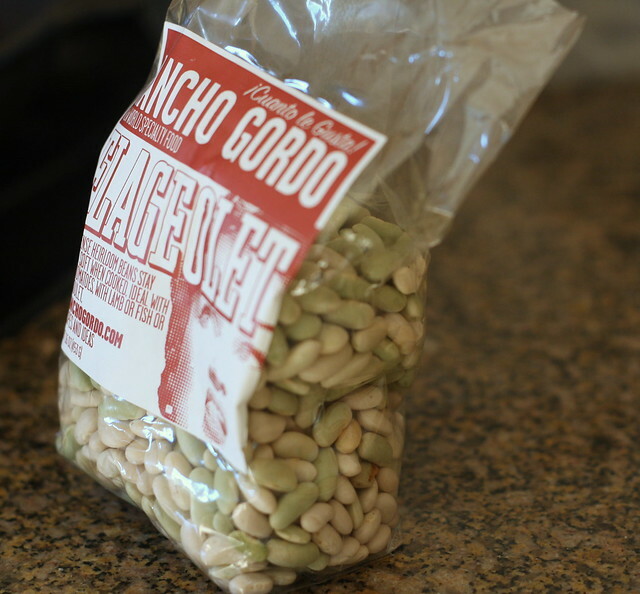 I used Rancho Gordo beans, which they say don’t require soaking (and they’re right!). They cook much faster, have a creamier texture, and are more delicious than most dried beans, but also have the price tag to prove it. 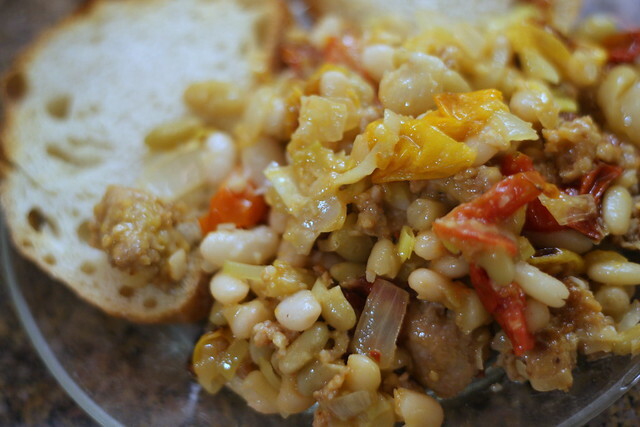 Canned beans also work just fine if you don’t have the time to cook your own. © 2010 —Salad for Dinner. All Rights Reserved. Powered by Wordpress.